Rumor has it that Jennifer Aniston just listed her Beverly Hills house for sale for $42 million dollars. Jennifer Aniston bought it for $ 13 million back in 2006 and had it totally renovated by designer Stephen Shadley, who worked before with Diane Keaton and Woody Allen. The house, which was designed by architect Harold W. Levitt in 1970, was under renovation at the time and was, Shadley recalls, “In rough shape. 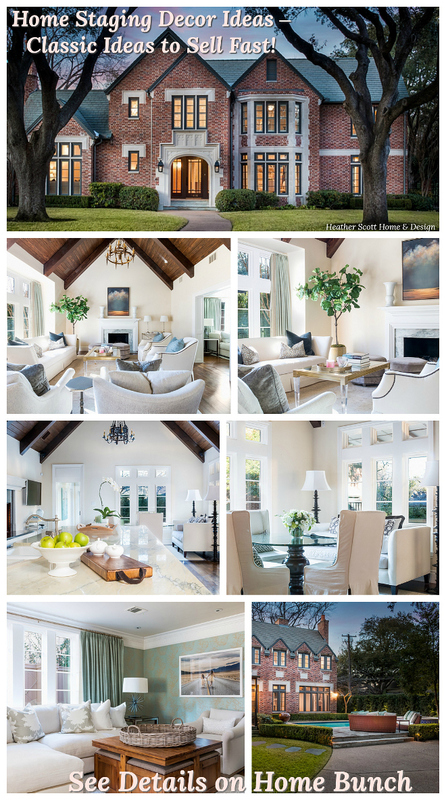 We essentially tore the house apart and rebuilt it.” Her beautiful house was famously featured in the March 2010 issue of Architectural Digest and she seemed extremely happy with the results: “I’d heard about this place, and when I saw it, I loved it. I knew it was my metier,” she told the magazine. According to The Real Estalker, Jennifer Aniston is planning on moving to New York City into a duplex penthouse in the West Village for $14,950,000, and might have already put in an offer on it. It seems that she’s selling her house in California because it’s too big for her and she’s wants a place where she actually feels more “at home”. My opinion? Seeing the pictures of Jennifer Aniston’s house I think it was more like a “bachelor” house, more for entertaining than actually living and maybe, just maybe, Jennifer is ready to settle down a little and have a place that reflects where she is in this moment of her life. This is an eco-friendly house and you can see the solar power panels on the roof. 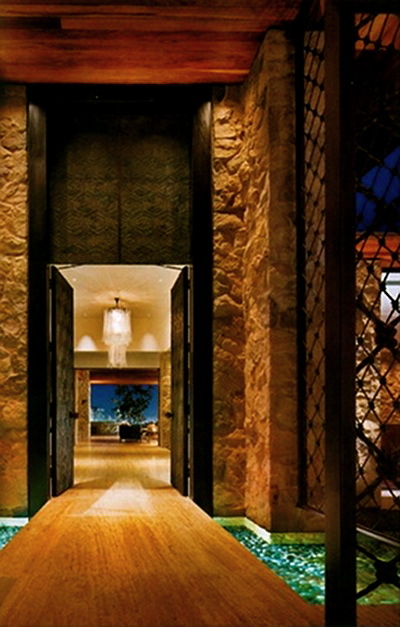 I simply love this entrance. It’s stunning! A very nice view of the back of the house and pool. This is one of my favorite parts of the house. 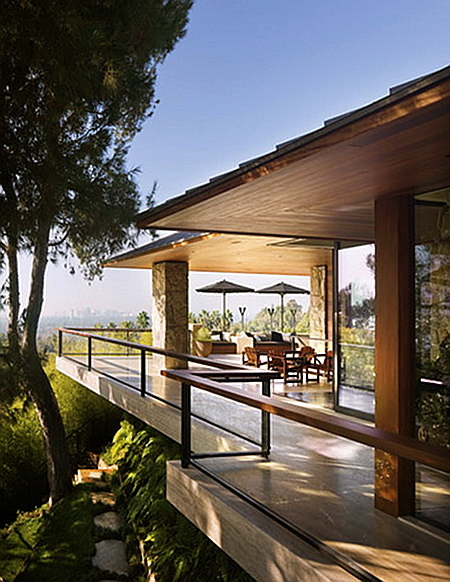 Imagine sitting there and just enjoying the sun and views of LA. Very stylish. 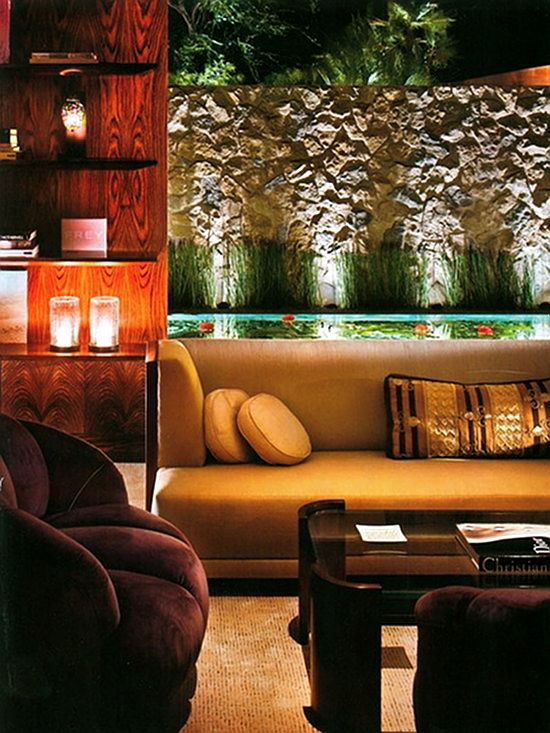 I especially like the tailored sofa. Do you like the purple chairs and curtains? 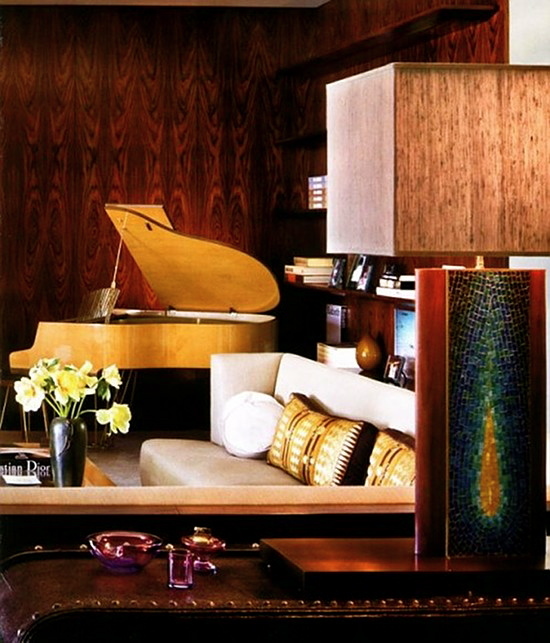 This is Jennifer Aniston’s fruitwood Sauter piano from the 1960’s. 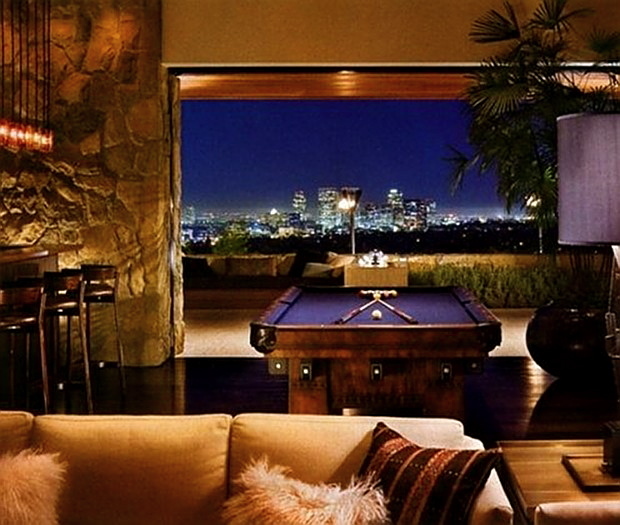 Great spot to have all of your friends over and enjoy this gorgeous view of Los Angeles. It seems that Jennifer Anniston is a connoisseur herself. What do you think of Jennifer Aniston’s bed? Notice the very large scale lamps. 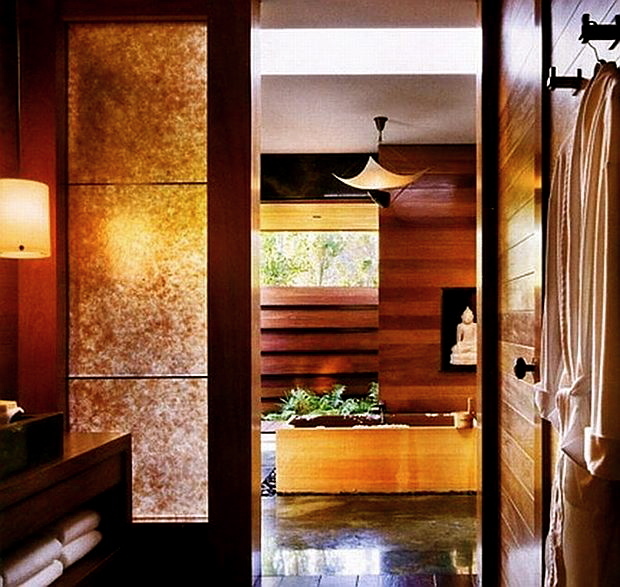 I really like this zen-spa inspired bathroom. I love this place, the trees and how natural it feels. This is simply perfection. 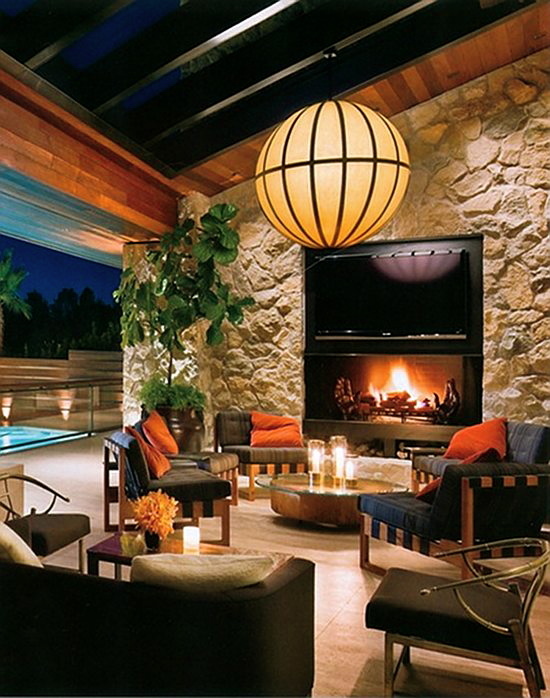 Outdoor fireplace, a plasma TV, a sparkling pool and LA. 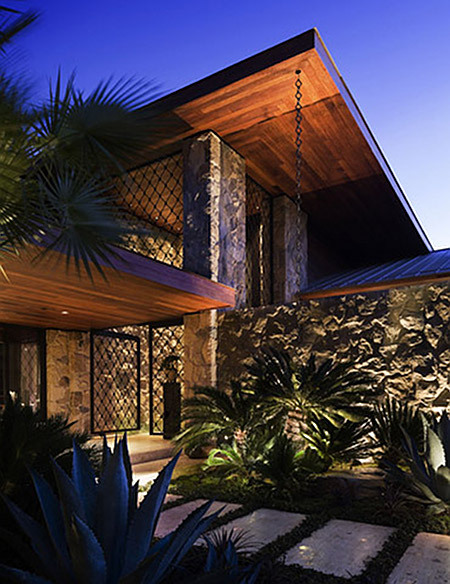 The plants, trees and fencing around helps create some privacy. Now, tell me, is Jennifer Aniston worth $42 million dollars? 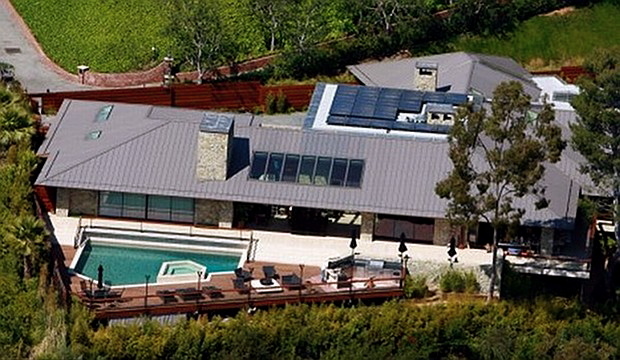 Is it right that many celebrities use their status to put a higher price on their real estate? Do you want to know my opinion? I really like Jennifer, but I doubt she will be able to sell for this much, even if the market was at its peak, which we all know it isn’t. time. The beach is cooler and less traffic. She is adorable and this house is stunning. She is so tiny for that hugh home. I love colors in this home that I usually don’t care for. Perfect! Sorry I am crazy, but I have been running in circles. I was under the weather a few days and got behind. I hope that you are having a wonderful weekend, friend. Don’t care for the house at all. Seems very artificial and cold. Wasn’t any better on the cover and inside AD. Hi Luciane! I hope you’re having a great weekend! I LOOOOVED this post! Her home seriously takes my breath away. I do prefer a little more color, but the style is right up my alley. I’d kill to have an outdoor space like that too…we just can’t have it here in MN! I think it’s a wonderful house, but never what I would have expected for her. I bet her NYC apartment will be more what I have envisioned. Hope you’re having a wonderful weekend and feeling back up to par!! 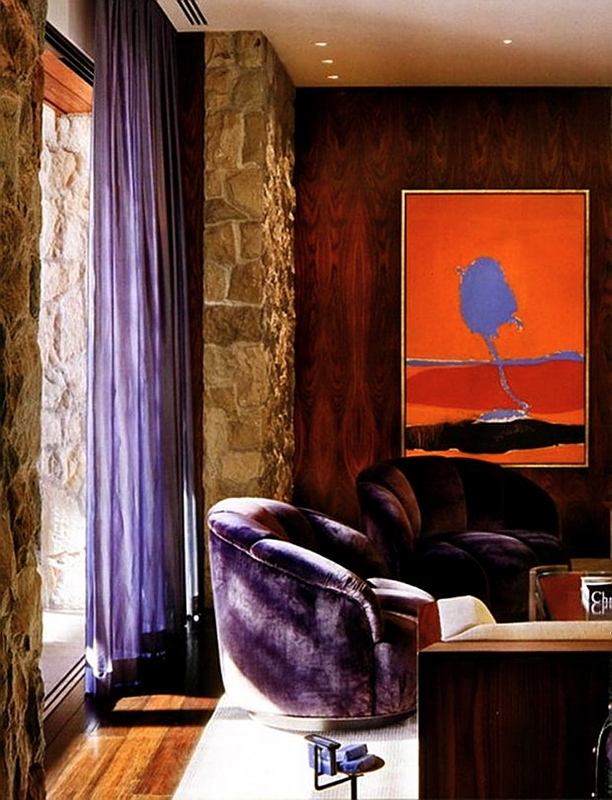 so fun to see her interiors–which are tres masculine. pretty smart lady. i mean, she’s single and what man wouldn’t want to spend time in those spaces, right? it’s priced right if she receives something close to what they’re asking. i’m ok with the higher price tag based on celebrity ownership. pretty sure it evens out when you consider the papanazi crap daily. hope you recover swiftly. i’m worn out from a fab weekend and it’s not even over! Her house is quite a showplace but I don’t really see it as a home. Don’t know about the market there but I think it falls short on location, location, location for that price. O que leva uma pessoa a decorar, o que tomou um bom tempo conforme li na AD, e em seguida vender? Bom, adoro a área externa da casa, as lareiras externas são o máximo. The home is beautiful but I am not real big on the purple. That does seem to be a high price for the house. Lovely home — worth every penny, considering that location and those views. Her new penthouse in the West Village seemed like a surprising buy to me — it doesn’t even have a “formal” dining room! Personally, I’d much rather live in this place! Nooooo way! It’s nice enough but no where near *that* nice. I agree with the celebrity status price tag. The decor doesn’t really match my idea of how I’d imagine it to be. But I certainly enjoyed the snoop around!! Thank you!! priced way too high! I kinda imagined jen’s house would be all white and more mod – but I guess not!! 42??? That’s too much $! 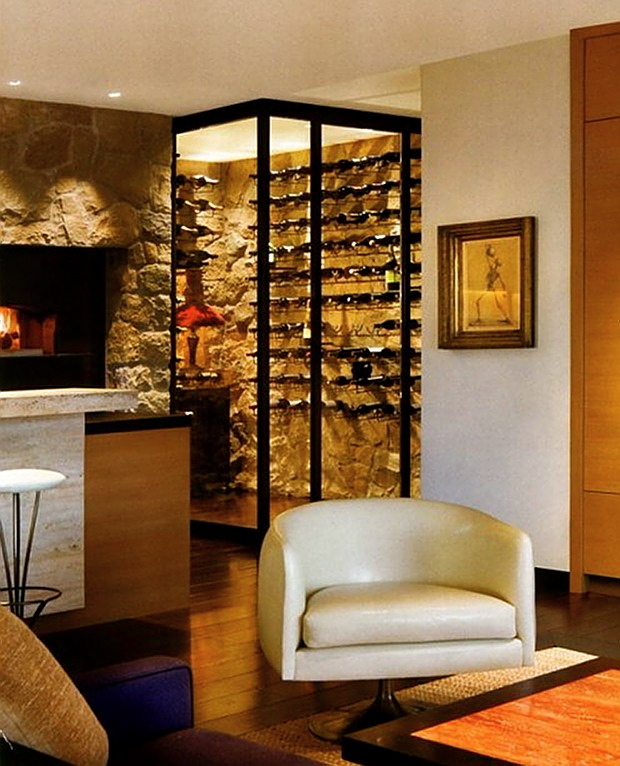 Well, the house is definitely a Hollywood home…. I could be happy in this gorgeous home. I love that it is so simple and uncluttered. Happy Valentine’s day, friend! I hope that you are feeling better. You take care of yourself, Lucian. 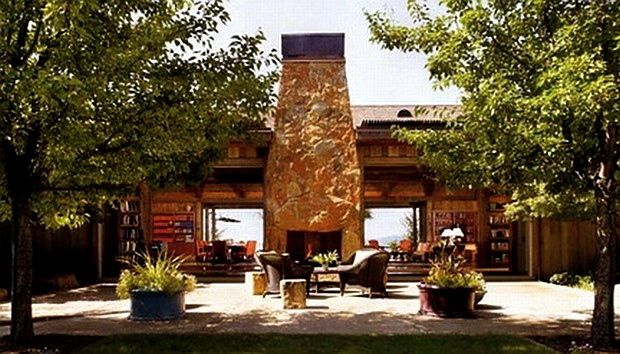 I think her home is very nice – the use of wood, stone, glass, water, etc. It is definitely not worth $42m. I have a feeling it’s going to be sitting on the market for awhile. I know of two beautiful homes in Beverly Hills right now on the market with great city views – one for $23m and the other for $16m and those have been on the market for a long time. I also agree with some of the other comments – not as private as I had thought or would expect. Have a great day everyone! I think I’ll buy this house and turn it into my party pad just for my DJ equipment . A little bit small for my taste. Love the house and the mix of natural textures: wood, stone, fireplaces, trees, … But where’s the kitchen and pizza oven? Another great idea. Szép a ház, de egy embernek túl nagy. Personally, I believe that she really does not want to sell the house, hence the astronomical price. The psychology behind it is this, if I sell the house at this price, how could I possibly refuse….but she really is not ready to sell the house and this is called “fishing”. I live in Venice and two houses have recently come up for sale – Robert Graham’s and Dennis Hopper’s – prices were high (not as high as this) and were not sold at prices asked for. As a matter of fact, I don’t think Grahams house has been sold as yet. 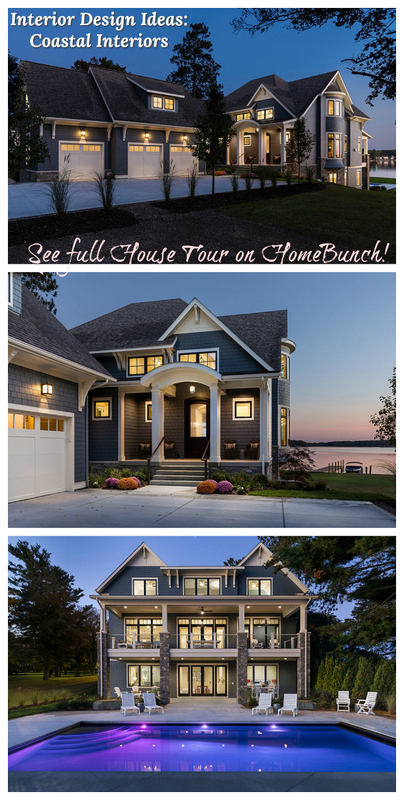 Jennifer’s house is lovely, but the $$$ – common on! Okay, so I am an east coast cat. I really have very little knowledge of west coast real estate. But, I do watch the Bravo network and I do watch that show, whats it called? Millionaire Real Estate or something like that? Anyway, the articles say she paid 13 million which is more than its worth now. Not an Iceburgs chance in hell that she will get anything near that. Not a penny over 20 and that is on the high end. Im thinking more like 8. There are some beautiful houses on the beach in Malibu for 5-8 that are just as nice! If I had 42million to spend, I wouldn’t spend it on a postage stamp sized lot! Way too many $$$! Is this really for sale? How much is this? The house is lovely. I wish I could live in a house like this with a beautiful woman like Jennifer Aniston. That would be great. Oh well, its not bad to dream isn’t it. This is an amazing place to live in.The architecture is great and with amazing design. The furniture stand its beauty with the beautiful walls and floors. Very cold, artificial and obtuse like the lonely owner herself. 42 Million, uh no. Hey newsflash…..the house just sold for $42M. She definitely made a profit from her the $13 she spent back iin ’06. She what hottness will get you these days? And oh, the house isn’t bad, relatively speaking. Although even at half the $42M, it’s still waay overpriced! At $42M, does it COME with Ms. Aniston?? I was going to say what Mark A said. My Mom’s friends bought it! Only the LA Times reported it went for 35-38 Million! How many school lunches is that? Its nice to see so many solar panels on the roof, all of the extra features draw power but the house can produce it, A+. Is that a pool or a small lake outside? Wow! I quite agree with Nick. 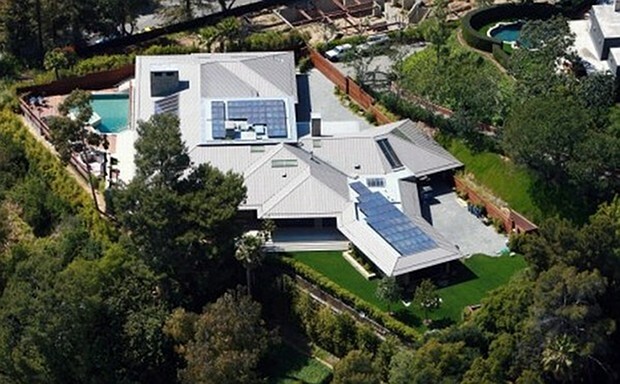 Its interesting that Aniston uses solar panels at her former home. As for the house design itself, I just love the cozy garden…is that a fireplace at the center? Anyway, I like the house overall but the $42M or even $35M price tag is a tad too much for me. I’ve always loved Jennifer Aniston. Her house is just as beautiful as her. Lovely home but definitely more masculine like a bachelor’s home. It’s not what I would have pictured for her. You are totally Right On in all you said, Over Priced and Very Masculine.